The Scoville Scale and Scoville Heat Unit (SHU) were named for scientist Wilbur Scoville in 1912. At the time, Scoville worked for a pharmaceutical company named Parke-Davis where he developed a test called the “Scoville Organoleptic Test” which is used to measure a chili pepper’s pungency and heat. Originally, Scoville ground up peppers and mixed them with sugar water, then tested them with a panel of tasters who sipped from these sugar-water-pepper solutions. He would then dilute the solutions bit by bit until they no longer burned the tongues of the tasters, after which he would assign a number to the pepper based on the number of dilutions needed to kill the heat. The measurements are divided into multiples of 100. 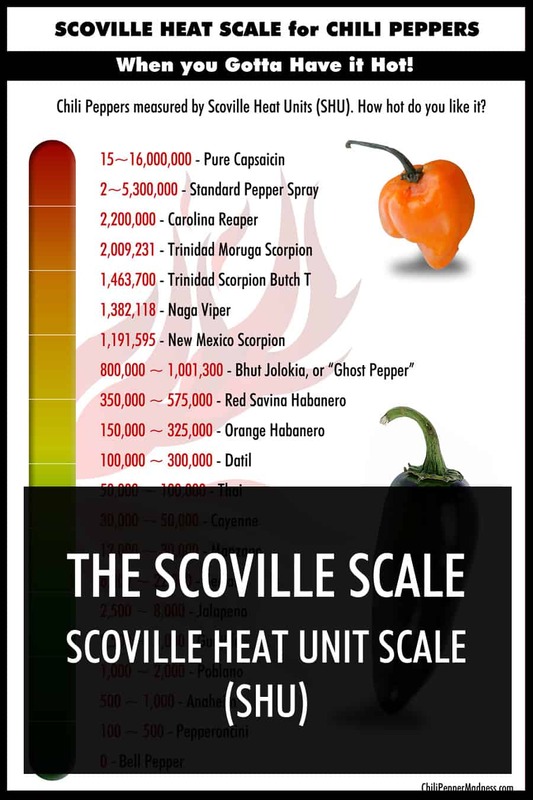 Note that 1 part per 1,000,000 dilutions of water is rated at 1.5 Scoville Units. Pure capsaicin, the stuff that makes chili peppers hot, is rated between 15 – 16,000,000 Scoville units. This is incredibly HOT! 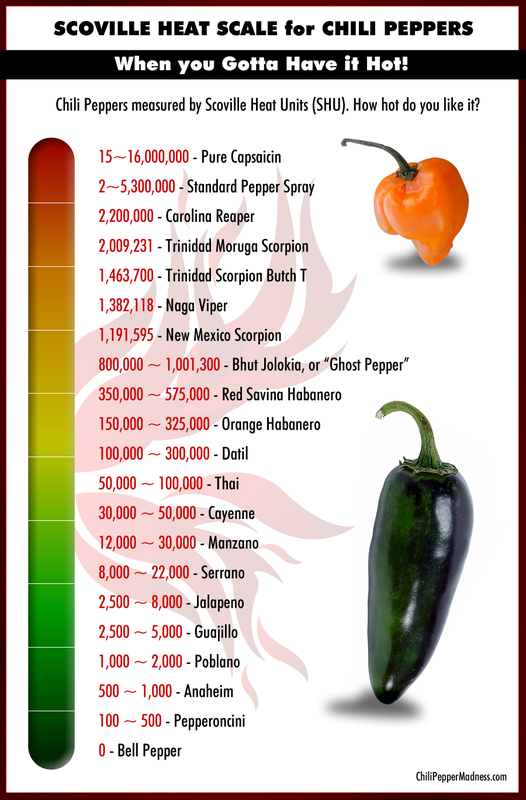 See the chart below to compare several peppers on the range of the scale, and how they relate to pure capsaicin. As noted in the FAQ section, several factors can affect the heat of a pepper, but they generally fall into the ranges listed below. Today, testing chili pepper heat is not quite so subjective. It has been replaced by High Performance Liquid Chromatography, or HPLC, which measures the pepper’s heat producing chemicals and rates them in ASTA pungency units. The Scoville Scale can be used to not only measure chili peppers, but anything that is made from chili peppers, such as hot sauce. What is really being measured is the concentration of “capsaicin”, the active ingredient that produces that sensation of heat on our tongues. The term “capsaicin” comes from the pepper plants’ classification, of the genus Capsicum. Capsaicin occurs naturally in peppers along with other capsaiciniods, all of which make up the unique tastes and heat reactions of each pepper, depending on their ratios. This is not a complete list of chili peppers, but rather a representation of some of the more popular chili peppers listed by heat level from hottest to mildest. Here is a list of Scoville Heat Units (SHU) of the most common chili peppers and hot sauces so you can get an understanding of how they relate to each other. The Red Savina Habanero Pepper was the original “hottest pepper in the world“, with a heat range of up to 580,000 Scoville Heat Units, but newer, hotter chili peppers came fast and hard in the last 20 years. Collectively called “superhot chili peppers”, these are peppers that top the 1 Million Scoville Heat Unit range, and I have some of them listed below. You can also review this link of Super Hot Chili Peppers List or my collection of Superhot Chili Peppers. The list of the hottest chili peppers in the world is growing all the time. Growers are producing hotter and hotter hybrids with hopes of pushing the Scoville Heat Scale limits. 2017 saw a flurry of news articles with potential new “hottest pepper in the world” claims, including the “Dragon’s Breath Pepper” and the ultra blazing “Pepper X“. However, there have been no official confirmation of tests performed. The “Dragon’s Breath Pepper” quite possibly may have been a publicity stunt, so there is little hope for that particular pepper, though “Pepper X” was propagated by Ed Curie, the man behind the current record holder, the “Carolina Reaper”. But for now, we can only await for more official announcements. Want More Chili Pepper Heat Information? What is the Hottest Chili Pepper in the World? Looking for Spicy Chili Pepper Recipes? I just finished laboratory testing, and our batch reached 2,398,587 Scoville Heat Units. A lot of variables play into the concentration of capsaicin in Capsicum Chinese “Carolina Reaper”. That is why any good test has many, many tests involved. Outliers are everywhere. Hope this helps. We actually had a batch of Coolapenos (hybrid) grown and bedded with some Cayenne peppers, they came out hotter than the Jalapenos did. Growing conditions surely must change the heat level for any kind of pepper I would think. Thomas, yes, growing conditions are a huge factor. Even the Carolina Reaper has a minimum capsaicin content, and I believe that measurement on the Scoville scale is 1,400,000. So it could be possible that two peppers juxtaposed where even a Butch T Trinidad Scorpion is hotter than a Carolina Reaper specimen. There are ranges with many peppers, sometimes very large ranges, particularly with the superhots. The heat can be affected greatly by growing conditions and other variables.